Does Boric Acid Kill Fruit Flies? 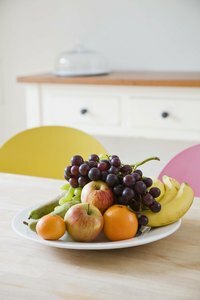 Although fruit flies are most common in late summer and early fall, they can be a year-round indoor problem if you keep perishable foods on your countertops. The insects are attracted to just about any fruit or vegetable left out to ripen or ferment. From egg to full maturity, fruit flies have a week-long lifespan. Within its short life cycle, however, a single female fruit fly can lay as many as 500 eggs. While prevention is key to keeping this pest out of your kitchen you have several eradication options, of which boric acid isn’t the most effective. Fruit flies are most attracted to fermenting organic material, which is why a bowl of grapes or a bunch of ripening bananas tend to draw them quickly. Sink drains, garbage disposals and trash containers tend to harbor films of moist, fermenting organic material, and are some of the insect’s preferred places to breed. Other potential breeding grounds include hidden, sticky spills; moist, dirty mops and empty food containers such as un-rinsed soft drink cans. Adult fruit flies can enter your house through doors or un-screened windows. It's also possible to introduce the pest to your kitchen via produce infested with unseen fruit fly eggs. Boric acid is a naturally-occurring, low-toxicity compound derived from the mineral boron. It functions as a pesticide, fungicide and herbicide. Boric acid powder poisons insects’ stomachs and absorbs waxes from the outer surfaces of insects with exoskeletons, causing them to dry out and die. It’s commonly used to kill cockroaches, fleas, ants, beetles, termites and fruit flies. While it works more slowly than most synthetic pesticides, it's very effective over time. When applied properly, the powder doesn’t volatilize or evaporate into the air, making it a somewhat safer option than synthetic pesticides, according to the website Beyond Pesticides. Because few insects have developed resistance to boric acid, it’s often used in bait products containing feed attractants. The loose powder is safest when applied in cracks, crevices and other places where it won’t be stirred up, moistened or come in contact with food, animals or people. For this reason, it’s often used to kill ants, cockroaches and other insects that travel along baseboards or go behind cupboards. If boric acid powder becomes wet it no longer functions properly. For this reason and because it takes a long time to be highly effective, boric acid isn’t the most effective eradication method for fast-breeding, moisture-loving fruit flies. As a first method of eradication, the website Pest Management Guidelines recommends setting out baited and sticky fruit fly traps. Pure vinegar followed by baking soda and boiling water safely kills fruit flies in sink drains and garbage disposals, and bleach or glass cleaner can be effective for cleaning trash containers. A non-toxic way to kill fruit flies calls for placing a paper funnel in a jar containing a piece of ripe banana sprinkled with yeast. One jar trap lasts about 10 days. Commercial pesticides containing pyrethrins, PPB, pemethrin, or tetramethrin are labeled for home use against fruit flies. When using boric acid powder against fruit flies, keep it out of children’s reach and don’t apply it near food. When swallowed, boric acid powder is a dangerous poison that can cause diarrhea, blue-green vomit, bright red rashes, convulsions, fever and even coma.